Once explained to them though, they start to understand that measuring AdWords performance is really straightforward as I’ll cover below. (Note – we are not going to cover Assisted Conversions and Conversion Attribution in this post which build a more complex picture of how clients find and interact with your site, and the influence PPC has – let’s leave that for another day). To measure performance, you need to do some set up work in Google Analytics. You’ll need Google Analytics for everything here, so make sure it is setup and the tracking code is installed. If it isn’t then ask your web developer to set it up for you. Once it is installed then make sure that you are using the same email address to login to both AdWords and Analytics. Login, go to admin and then confirm AdWords is linked. What type of website does your business have - is it lead generation or Ecommerce? Does your website generate leads? I.E. it isn’t an online shop, it’s a site which people find and then hopefully make contact by sending a message or calling you. Then it’s a lead generation tool and measuring ENQUIRIES is key, Here’s how do you do it. Most commonly enquiries either come through a contact form or a telephone call. Both can be measured and SHOULD be measured. If your contact form completion is on a separate URL e.g. www.mywebsite.co.uk/thanks then the URL is set as a goal. This is easy and you can do it yourself in the admin section. If you DON’T have a separate URL then it is a little more complex. In this scenario Google Tag Manager needs installing (HOW many Google products ARE THERE you ask?!) The button that sends the form is then setup to trigger and fire an EVENT. That event is then set as a GOAL in Google Analytics. Generally we’d recommend someone who is proficient in Tag Manager does this. Now the Contact Form is setup you need to go back to AdWords and import the GOAL. We will go through this in a minute. 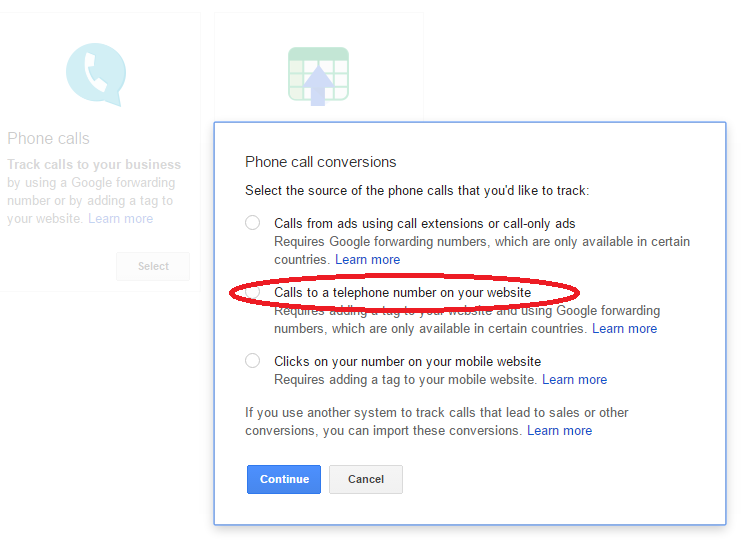 It’s free to track telephone calls from your website that came from AdWords Ads. I’ll quickly repeat that – IT IS FREE. HOW THE DEVIL DOES THAT WORK? Well briefly, you’ll need a developer to install some code onto your website. This replaces your telephone number with a dynamic telephone number. Now, when some visits your site from any channel EXCLUDING AdWords your same telephone number is shown exactly as before. But when someone visits your site by clicking on an AdWords Ad, the telephone number dynamically changes to a unique telephone number. When they call that number, AdWords tracks the source right back to the keyword – clever eh? BTW – did I mention it is FREE?! Calls To A Telephone Number On Your Website. This will both setup the goal and generate the code your developer needs to add to the website. WHAT ABOUT THOSE CONTACT FORMS? Go to Tools > Conversions again. 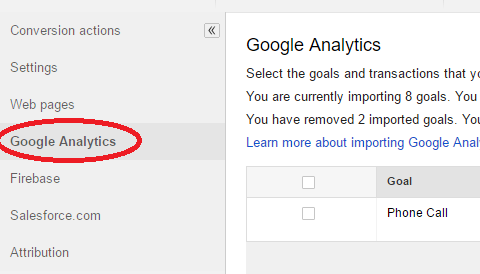 On the left hand side find Google Analytics and import your Contact Form GOAL. WHAT ABOUT MEASURING PERFORMANCE THOUGH? Now you’ve setup the call and contact form conversions go and make a cup of tea. Come back some time later once a conversion has happened. Now with your data populated you can see how much you’ve spent (cost), how many enquires (conversions) it has generated AND the cost of each enquiry (cost / conv). THAT IS PRETTY MUCH ALL YOU NEED TO KNOW. Can customers order and pay for items on your website? Then it’s an e-commerce site and measuring TRANSACTIONS is key. Here’s how do you do it. E-Commerce is similar to lead generation except instead of enquiries we are tracking orders and their values. To do this again you need Google Analytics setting up and linking as above. After that you need the E-Commerce module setting up. This tracks orders including product and order value. Generally you will need a web developer to do this. Once that is done go back to AdWords > Tools > Google Analytics and this time import Transactions. Now go to Campaigns and modify the columns as below. This time you will now be able to see how much you’ve spent (cost), how many sales (conversions) it has generated and the cost of each sale (cost / conv). Addditionally you can see the total value of those sales (All conv. value). 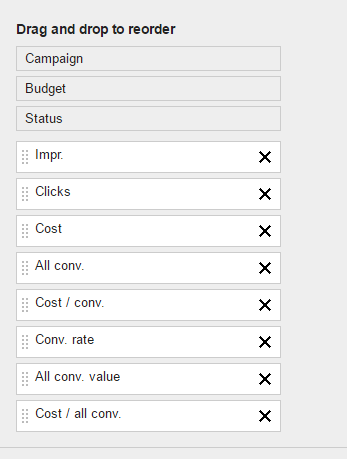 Divide your All conv value by the cost and you will calculate your return on Ad spend.